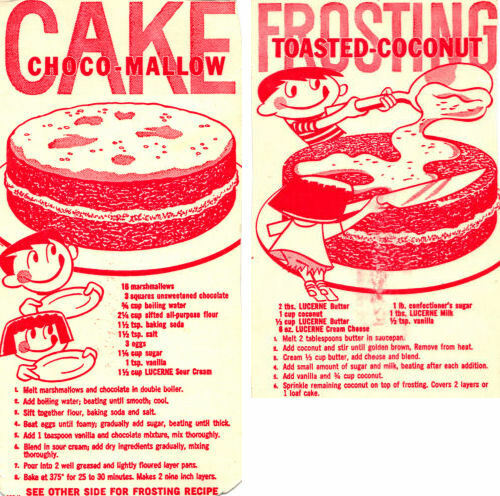 Here are two recipes that were clipped from packaging of some kind, likely a Lucerne dairy product. These were found in a large collection, date unknown. I’ve typed them both below along with scanned copies. Melt marshmallows and chocolate in double boiler. Add boiling water; beating until smooth; cool. Beat eggs until foamy; gradually add sugar, beating until thick. Add 1 teaspoon vanilla and chocolate mixture, mix thoroughly. Blend in sour cream; add dry ingredients gradually, mixing thoroughly. Pour into 2 well greased and lightly floured layer pans. Bake at 375° for 25 to 30 minutes. Makes 2 nine inch layers. Melt 2 tablespoons butter in saucepan. Add coconut and stir until golden brown, remove from heat. Cream 1/3 cup butter, add cheese and blend. Add small amount of sugar and milk, beating after each addition. Add vanilla and 3/4 cup coconut. Sprinkle remaining coconut on top of frosting. Covers 2 layers or 1 loaf cake. I love these vintage recipes! Thanks!